These bags pack a powerful punch. They are made with superior clear resins in the USA. Designed with you in mind, these trash can liners are 1 Mil Thick and durable. Forget about ripped trash bags, these bags can hold up to nearly anything. Buy the brand you can trust with quality you can count on. PlasticMill. "One in a Mil". 12-16 Gallon, 24x31 IN, extra tall bags, perfect for regular size kitchen trash can. 1 Mil thick and strong, designed to hold heavy weight. Can be used for a variety of things office, backyard, outdoor use, and storage bags. Low density trash bags durable and flexible, they are highly resistant to puncturing and tearing. Loose Folded Making It convenient for easy removal, 500 Bags per case. 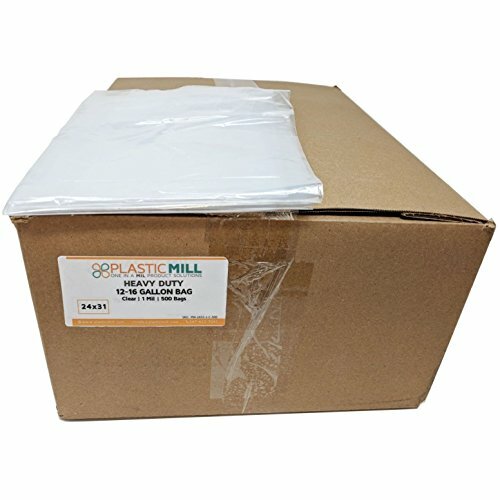 If you have any questions about this product by PlasticMill, contact us by completing and submitting the form below. If you are looking for a specif part number, please include it with your message.